Adeno-associated virus serotype 2 structure from 1LP3. One fivefold axis shown center. 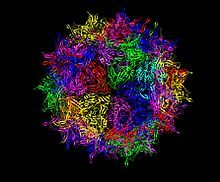 Adeno-associated virus (AAV) is a small virus that infects humans and some other primate species. AAV is not currently known to cause disease. The virus causes a very mild immune response, lending further support to its apparent lack of pathogenicity. In many cases, AAV vectors integrate into the host cell genome, which can be important for certain applications, but can also have unwanted consequences. Gene therapy vectors using AAV can infect both dividing and quiescent cells and persist in an extrachromosomal state without integrating into the genome of the host cell, although in the native virus some integration of virally carried genes into the host genome does occur. These features make AAV a very attractive candidate for creating viral vectors for gene therapy, and for the creation of isogenic human disease models. Recent human clinical trials using AAV for gene therapy in the retina have shown promise. AAV belongs to the genus Dependoparvovirus, which in turn belongs to the family Parvoviridae. The virus is a small (20 nm) replication-defective, nonenveloped virus. The adeno-associated virus (AAV), previously thought to be a contaminant in adenovirus preparations, was first identified as a dependovirus in the 1960s in the laboratories of Bob Atchison at Pittsburgh and Wallace Rowe at NIH. Serological studies in humans subsequently indicated that, despite being present in people infected by helper viruses such as adenovirus or herpes virus, AAV itself did not cause any disease. Wild-type AAV has attracted considerable interest from gene therapy researchers due to a number of features. Chief amongst these is the virus's apparent lack of pathogenicity. It can also infect non-dividing cells and has the ability to stably integrate into the host cell genome at a specific site (designated AAVS1) in the human chromosome 19. This feature makes it somewhat more predictable than retroviruses, which present the threat of a random insertion and of mutagenesis, which is sometimes followed by development of a cancer. The AAV genome integrates most frequently into the site mentioned, while random incorporations into the genome take place with a negligible frequency. Development of AAVs as gene therapy vectors, however, has eliminated this integrative capacity by removal of the rep and cap from the DNA of the vector. The desired gene together with a promoter to drive transcription of the gene is inserted between the inverted terminal repeats (ITR) that aid in concatemer formation in the nucleus after the single-stranded vector DNA is converted by host cell DNA polymerase complexes into double-stranded DNA. AAV-based gene therapy vectors form episomal concatemers in the host cell nucleus. In non-dividing cells, these concatemers remain intact for the life of the host cell. In dividing cells, AAV DNA is lost through cell division, since the episomal DNA is not replicated along with the host cell DNA. Random integration of AAV DNA into the host genome is detectable but occurs at very low frequency. AAVs also present very low immunogenicity, seemingly restricted to generation of neutralizing antibodies, while they induce no clearly defined cytotoxic response. This feature, along with the ability to infect quiescent cells present their dominance over adenoviruses as vectors for human gene therapy. Use of the virus does present some disadvantages. The cloning capacity of the vector is relatively limited and most therapeutic genes require the complete replacement of the virus's 4.8 kilobase genome. Large genes are, therefore, not suitable for use in a standard AAV vector. Options are currently being explored to overcome the limited coding capacity. The AAV ITRs of two genomes can anneal to form head to tail concatemers, almost doubling the capacity of the vector. Insertion of splice sites allows for the removal of the ITRs from the transcript. Because of AAV's specialized gene therapy advantages, researchers have created an altered version of AAV termed self-complementary adeno-associated virus (scAAV). Whereas AAV packages a single strand of DNA and must wait for its second strand to be synthesized, scAAV packages two shorter strands that are complementary to each other. By avoiding second-strand synthesis, scAAV can express more quickly, although as a caveat, scAAV can only encode half of the already limited capacity of AAV. Recent reports suggest that scAAV vectors are more immunogenic than single stranded adenovirus vectors, inducing a stronger activation of cytotoxic T lymphocytes. The humoral immunity instigated by infection with the wild type is thought to be a very common event. The associated neutralising activity limits the usefulness of the most commonly used serotype AAV2 in certain applications. Accordingly, the majority of clinical trials currently under way involve delivery of AAV2 into the brain, a relatively immunologically privileged organ. In the brain, AAV2 is strongly neuron-specific. To date, AAV vectors have been used in over 117 clinical trials worldwide, approximately 5.6% of virus-vectored gene-therapy trials. Recently, promising results have been obtained from Phase 1 and Phase 2 trials for a number of diseases, including Leber's congenital amaurosis, Hemophilia, congestive heart failure, spinal muscular atrophy, lipoprotein lipase deficiency, and Parkinson's disease. The AAV genome is built of single-stranded deoxyribonucleic acid (ssDNA), either positive- or negative-sensed, which is about 4.7 kilobase long. The genome comprises inverted terminal repeats (ITRs) at both ends of the DNA strand, and two open reading frames (ORFs): rep and cap. The former is composed of four overlapping genes encoding Rep proteins required for the AAV life cycle, and the latter contains overlapping nucleotide sequences of capsid proteins: VP1, VP2 and VP3, which interact together to form a capsid of an icosahedral symmetry. The Inverted Terminal Repeat (ITR) sequences comprise 145 bases each. They were named so because of their symmetry, which was shown to be required for efficient multiplication of the AAV genome. The feature of these sequences that gives them this property is their ability to form a hairpin, which contributes to so-called self-priming that allows primase-independent synthesis of the second DNA strand. The ITRs were also shown to be required for both integration of the AAV DNA into the host cell genome (19th chromosome in humans) and rescue from it, as well as for efficient encapsidation of the AAV DNA combined with generation of a fully assembled, deoxyribonuclease-resistant AAV particles. With regard to gene therapy, ITRs seem to be the only sequences required in cis next to the therapeutic gene: structural (cap) and packaging (rep) proteins can be delivered in trans. With this assumption many methods were established for efficient production of recombinant AAV (rAAV) vectors containing a reporter or therapeutic gene. However, it was also published that the ITRs are not the only elements required in cis for the effective replication and encapsidation. A few research groups have identified a sequence designated cis-acting Rep-dependent element (CARE) inside the coding sequence of the rep gene. CARE was shown to augment the replication and encapsidation when present in cis. On the "left side" of the genome there are two promoters called p5 and p19, from which two overlapping messenger ribonucleic acids (mRNAs) of different length can be produced. Each of these contains an intron which can be either spliced out or not. Given these possibilities, four various mRNAs, and consequently four various Rep proteins with overlapping sequence can be synthesized. Their names depict their sizes in kilodaltons (kDa): Rep78, Rep68, Rep52 and Rep40. Rep78 and 68 can specifically bind the hairpin formed by the ITR in the self-priming act and cleave at a specific region, designated terminal resolution site, within the hairpin. They were also shown to be necessary for the AAVS1-specific integration of the AAV genome. All four Rep proteins were shown to bind ATP and to possess helicase activity. It was also shown that they upregulate the transcription from the p40 promoter (mentioned below), but downregulate both p5 and p19 promoters. The right side of a positive-sensed AAV genome encodes overlapping sequences of three capsid proteins, VP1, VP2 and VP3, which start from one promoter, designated p40. The molecular weights of these proteins are 87, 72 and 62 kiloDaltons, respectively. The AAV capsid is composed of a mixture of VP1, VP2, and VP3 totaling 60 monomers arranged in icosahedral symmetry in a ratio of 1:1:10, with an estimated size of 3.9 MegaDaltons. The crystal structure of the VP3 protein was determined by Xie, Bue, et al. AAV2 capsid, shown as a ribbon diagram, with the back half hidden for clarity. One fivefold symmetry axis is shown center. The cap gene produces an additional, non-structural protein called the Assembly-Activating Protein (AAP). This protein is produced from ORF2 and is essential for the capsid-assembly process. The exact function of this protein in the assembly process and its structure have not been solved to date. All three VPs are translated from one mRNA. After this mRNA is synthesized, it can be spliced in two different manners: either a longer or shorter intron can be excised resulting in the formation of two pools of mRNAs: a 2.3 kb- and a 2.6 kb-long mRNA pool. Usually, especially in the presence of adenovirus, the longer intron is preferred, so the 2.3-kb-long mRNA represents the so-called "major splice". In this form the first AUG codon, from which the synthesis of VP1 protein starts, is cut out, resulting in a reduced overall level of VP1 protein synthesis. The first AUG codon that remains in the major splice is the initiation codon for VP3 protein. However, upstream of that codon in the same open reading frame lies an ACG sequence (encoding threonine) which is surrounded by an optimal Kozak context. This contributes to a low level of synthesis of VP2 protein, which is actually VP3 protein with additional N terminal residues, as is VP1. Since the bigger intron is preferred to be spliced out, and since in the major splice the ACG codon is a much weaker translation initiation signal, the ratio at which the AAV structural proteins are synthesized in vivo is about 1:1:20, which is the same as in the mature virus particle. The unique fragment at the N terminus of VP1 protein was shown to possess the phospholipase A2 (PLA2) activity, which is probably required for the releasing of AAV particles from late endosomes. Muralidhar et al. reported that VP2 and VP3 are crucial for correct virion assembly. More recently, however, Warrington et al. showed VP2 to be unnecessary for the complete virus particle formation and an efficient infectivity, and also presented that VP2 can tolerate large insertions in its N terminus, while VP1 can not, probably because of the PLA2 domain presence. Until the 1990s, virtually all AAV biology was studied using AAV serotype 2. However, AAV is highly prevalent in humans and other primates and several serotypes have been isolated from various tissue samples. Serotypes 2, 3, 5, and 6 were discovered in human cells, AAV serotypes 1, 4, and 7–11 in nonhuman primate samples. As of 2006 there have been 11 AAV serotypes described, the 11th in 2004. AAV capsid proteins contain 12 hypervariable surface regions, with most variability occurring in the threefold proximal peaks, but the parvovirus genome in general presents highly conserved replication and structural genes across serotypes. All of the known serotypes can infect cells from multiple diverse tissue types. Tissue specificity is determined by the capsid serotype and pseudotyping of AAV vectors to alter their tropism range will likely be important to their use in therapy. Serotype 2 (AAV2) has been the most extensively examined so far. AAV2 presents natural tropism towards skeletal muscles, neurons, vascular smooth muscle cells and hepatocytes. Three cell receptors have been described for AAV2: heparan sulfate proteoglycan (HSPG), aVβ5 integrin and fibroblast growth factor receptor 1 (FGFR-1). The first functions as a primary receptor, while the latter two have a co-receptor activity and enable AAV to enter the cell by receptor-mediated endocytosis. These study results have been disputed by Qiu, Handa, et al. HSPG functions as the primary receptor, though its abundance in the extracellular matrix can scavenge AAV particles and impair the infection efficiency. Studies have shown that serotype 2 of the virus (AAV-2) apparently kills cancer cells without harming healthy ones. "Our results suggest that adeno-associated virus type 2, which infects the majority of the population but has no known ill effects, kills multiple types of cancer cells yet has no effect on healthy cells," said Craig Meyers, a professor of immunology and microbiology at the Penn State College of Medicine in Pennsylvania in 2005. This could lead to a new anti-cancer agent. Although AAV2 is the most popular serotype in various AAV-based research, it has been shown that other serotypes can be more effective as gene delivery vectors. For instance AAV6 appears much better in infecting airway epithelial cells, AAV7 presents very high transduction rate of murine skeletal muscle cells (similarly to AAV1 and AAV5), AAV8 is superb in transducing hepatocytes and AAV1 and 5 were shown to be very efficient in gene delivery to vascular endothelial cells. In the brain, most AAV serotypes show neuronal tropism, while AAV5 also transduces astrocytes. AAV6, a hybrid of AAV1 and AAV2, also shows lower immunogenicity than AAV2. Serotypes can differ with the respect to the receptors they are bound to. For example, AAV4 and AAV5 transduction can be inhibited by soluble sialic acids (of different form for each of these serotypes), and AAV5 was shown to enter cells via the platelet-derived growth factor receptor. There have been many efforts to engineer and improve new AAV variants for both clinical and research purposes. Such modifications include new tropisms to target specific tissues, and modified surface residues to evade detection by the immune system. Beyond opting for particular strains of recombinant AAV(rAAV) to target particular cells, researchers have also explored AAV pseudotyping, the practice of creating hybrids of certain AAV strains to approach an even more refined target. The hybrid is created by taking a capsid from one strain and the genome from another strain. For example, research involving AAV2/5, a hybrid with the genome of AAV2 and the capsid of AAV5, was able to achieve more accuracy and range in brain cells than AAV2 would be able to achieve unhybridized. Researchers have continued to experiment with pseudotyping by creating strains with hybrid capsids. AAV-DJ has a hybrid capsid from eight different strains of AAV; as such, it can infect different cells throughout many areas of the body, a property which a single strain of AAV with a limited tropism would not have. Other efforts to engineer and improve new AAV variants have involved the ancestral reconstruction of virus variants to generate new vectors with enhanced properties for clinical applications and the study of AAV biology. AAV is of particular interest to gene therapists due to its apparent limited capacity to induce immune responses in humans, a factor which should positively influence vector transduction efficiency while reducing the risk of any immune-associated pathology. AAV is not considered to have any known role in disease. The innate immune response to the AAV vectors has been characterised in animal models. Intravenous administration in mice causes transient production of pro-inflammatory cytokines and some infiltration of neutrophils and other leukocytes into the liver, which seems to sequester a large percentage of the injected viral particles. Both soluble factor levels and cell infiltration appear to return to baseline within six hours. By contrast, more aggressive viruses produce innate responses lasting 24 hours or longer. The virus is known to instigate robust humoral immunity in animal models and in the human population, where up to 80% of individuals are thought to be seropositive for AAV2. Antibodies are known to be neutralising, and for gene therapy applications these do impact on vector transduction efficiency via some routes of administration. As well as persistent AAV specific antibody levels, it appears from both prime-boost studies in animals and from clinical trials that the B-cell memory is also strong. In seropositive humans, circulating IgG antibodies for AAV2 appear to be primarily composed of the IgG1 and IgG2 subclasses, with little or no IgG3 or IgG4 present. The cell-mediated response to the virus and to vectors is poorly characterised, and has been largely ignored in the literature as recently as 2005. Clinical trials using an AAV2-based vector to treat haemophilia B seem to indicate that targeted destruction of transduced cells may be occurring. Combined with data that shows that CD8+ T-cells can recognise elements of the AAV capsid in vitro, it appears that there may be a cytotoxic T lymphocyte response to AAV vectors. Cytotoxic responses would imply the involvement of CD4+ T helper cells in the response to AAV and in vitro data from human studies suggests that the virus may indeed induce such responses, including both Th1 and Th2 memory responses. A number of candidate T cell stimulating epitopes have been identified within the AAV capsid protein VP1, which may be attractive targets for modification of the capsid if the virus is to be used as a vector for gene therapy. release from the infected cell. Some of these steps may look different in various types of cells, which, in part, contributes to the defined and quite limited native tropism of AAV. Replication of the virus can also vary in one cell type, depending on the cell's current cell cycle phase. The characteristic feature of the adeno-associated virus is a deficiency in replication and thus its inability to multiply in unaffected cells. Adeno-associated virus spreads by co-infecting a cell with a helper virus. The first helper virus that was described as providing successful generation of new AAV particles, was the adenovirus, from which the AAV name originated. It was then shown that AAV replication can be facilitated by selected proteins derived from the adenovirus genome, by other viruses such as HSV or vaccinia, or by genotoxic agents, such as UV irradiation or hydroxyurea. Depending on the presence or absence of a helper virus, the life cycle of AAV follows either a lytic or lysogenic pathway, respectively. If there is a helper virus, AAV’s gene expression activates, allowing the virus to replicate using the host cell’s polymerase. When the helper virus kills the host cell, the new AAV virions are released. If there is not a helper virus present, AAV exhibits lysogenic behavior. When AAV infects a cell alone, its gene expression is repressed (AAV does not replicate), and its genome is incorporated into the host genome (into human chromosome 19). In rare cases, lysis can occur without a helper virus, but usually AAV can not replicate and kill a cell on its own. The minimal set of the adenoviral genes required for efficient generation, of progeny AAV particles, was discovered by Matsushita, Ellinger et al. This discovery allowed for new production methods of recombinant AAV, which do not require adenoviral co-infection of the AAV-producing cells. In the absence of helper virus or genotoxic factors, AAV DNA can either integrate into the host genome or persist in episomal form. In the former case integration is mediated by Rep78 and Rep68 proteins and requires the presence of ITRs flanking the region being integrated. In mice, the AAV genome has been observed persisting for long periods of time in quiescent tissues, such as skeletal muscles, in episomal form (a circular head-to-tail conformation). ^ Deyle DR, Russell DW (August 2009). "Adeno-associated virus vector integration". Current Opinion in Molecular Therapeutics. 11 (4): 442–7. PMC 2929125. PMID 19649989. ^ Grieger JC, Samulski RJ (2005). "Adeno-associated Virus as a Gene Therapy Vector: Vector Development, Production and Clinical Applications". Adeno-associated virus as a gene therapy vector: vector development, production and clinical applications. Advances in Biochemical Engineering/Biotechnology. 99. pp. 119–45. doi:10.1007/10_005. ISBN 978-3-540-28404-8. PMID 16568890. ^ a b Maguire AM, Simonelli F, Pierce EA, Pugh EN, Mingozzi F, Bennicelli J, et al. (May 2008). "Safety and efficacy of gene transfer for Leber's congenital amaurosis". The New England Journal of Medicine. 358 (21): 2240–8. doi:10.1056/NEJMoa0802315. PMC 2829748. PMID 18441370. ^ Carter BJ (December 2004). "Adeno-associated virus and the development of adeno-associated virus vectors: a historical perspective". Molecular Therapy. 10 (6): 981–9. doi:10.1016/j.ymthe.2004.09.011. PMID 15564130. ^ Kotin RM, Siniscalco M, Samulski RJ, Zhu XD, Hunter L, Laughlin CA, McLaughlin S, Muzyczka N, Rocchi M, Berns KI (March 1990). "Site-specific integration by adeno-associated virus". Proceedings of the National Academy of Sciences of the United States of America. 87 (6): 2211–5. Bibcode:1990PNAS...87.2211K. doi:10.1073/pnas.87.6.2211. PMC 53656. PMID 2156265. ^ Surosky RT, Urabe M, Godwin SG, McQuiston SA, Kurtzman GJ, Ozawa K, Natsoulis G (October 1997). "Adeno-associated virus Rep proteins target DNA sequences to a unique locus in the human genome". Journal of Virology. 71 (10): 7951–9. PMC 192153. PMID 9311886. ^ a b Daya S, Berns KI (October 2008). "Gene therapy using adeno-associated virus vectors". Clinical Microbiology Reviews. 21 (4): 583–93. doi:10.1128/CMR.00008-08. PMC 2570152. PMID 18854481. ^ Chirmule N, Propert K, Magosin S, Qian Y, Qian R, Wilson J (September 1999). "Immune responses to adenovirus and adeno-associated virus in humans". Gene Therapy. 6 (9): 1574–83. doi:10.1038/sj.gt.3300994. PMID 10490767. ^ Hernandez YJ, Wang J, Kearns WG, Loiler S, Poirier A, Flotte TR (October 1999). "Latent adeno-associated virus infection elicits humoral but not cell-mediated immune responses in a nonhuman primate model". Journal of Virology. 73 (10): 8549–58. PMC 112875. PMID 10482608. ^ Ponnazhagan S, Mukherjee P, Yoder MC, Wang XS, Zhou SZ, Kaplan J, Wadsworth S, Srivastava A (April 1997). "Adeno-associated virus 2-mediated gene transfer in vivo: organ-tropism and expression of transduced sequences in mice". Gene. 190 (1): 203–10. doi:10.1016/S0378-1119(96)00576-8. PMID 9185868. ^ McCarty DM, Monahan PE, Samulski RJ (August 2001). "Self-complementary recombinant adeno-associated virus (scAAV) vectors promote efficient transduction independently of DNA synthesis". Gene Therapy. 8 (16): 1248–54. doi:10.1038/sj.gt.3301514. PMID 11509958. ^ Rogers GL, Martino AT, Zolotukhin I, Ertl HC, Herzog RW (January 2014). "Role of the vector genome and underlying factor IX mutation in immune responses to AAV gene therapy for hemophilia B". Journal of Translational Medicine. 12: 25. doi:10.1186/1479-5876-12-25. PMC 3904690. PMID 24460861. ^ "Vectors used in Gene Therapy Clinical Trials". Journal of Gene Medicine. Wiley. February 2016. ^ Bainbridge JW, Smith AJ, Barker SS, Robbie S, Henderson R, Balaggan K, Viswanathan A, Holder GE, Stockman A, Tyler N, Petersen-Jones S, Bhattacharya SS, Thrasher AJ, Fitzke FW, Carter BJ, Rubin GS, Moore AT, Ali RR (May 2008). "Effect of gene therapy on visual function in Leber's congenital amaurosis". The New England Journal of Medicine. 358 (21): 2231–9. CiteSeerX 10.1.1.574.4003. doi:10.1056/NEJMoa0802268. PMID 18441371. ^ Hauswirth WW, Aleman TS, Kaushal S, Cideciyan AV, Schwartz SB, Wang L, Conlon TJ, Boye SL, Flotte TR, Byrne BJ, Jacobson SG (October 2008). "Treatment of leber congenital amaurosis due to RPE65 mutations by ocular subretinal injection of adeno-associated virus gene vector: short-term results of a phase I trial". Human Gene Therapy. 19 (10): 979–90. doi:10.1089/hum.2008.107. PMC 2940541. PMID 18774912. ^ Nathwani AC, Tuddenham EG, Rangarajan S, Rosales C, McIntosh J, Linch DC, et al. (December 2011). "Adenovirus-associated virus vector-mediated gene transfer in hemophilia B". The New England Journal of Medicine. 365 (25): 2357–65. doi:10.1056/NEJMoa1108046. PMC 3265081. PMID 22149959. ^ Jessup M, Greenberg B, Mancini D, Cappola T, Pauly DF, Jaski B, Yaroshinsky A, Zsebo KM, Dittrich H, Hajjar RJ (July 2011). "Calcium Upregulation by Percutaneous Administration of Gene Therapy in Cardiac Disease (CUPID): a phase 2 trial of intracoronary gene therapy of sarcoplasmic reticulum Ca2+-ATPase in patients with advanced heart failure". Circulation. 124 (3): 304–13. doi:10.1161/CIRCULATIONAHA.111.022889. PMC 5843948. PMID 21709064. ^ "AveXis Reports Data from Ongoing Phase 1 Trial of AVXS-101 in Spinal Muscular Atrophy Type 1". Avexis. 6 May 2016. ^ LeWitt PA, Rezai AR, Leehey MA, Ojemann SG, Flaherty AW, Eskandar EN, et al. (April 2011). "AAV2-GAD gene therapy for advanced Parkinson's disease: a double-blind, sham-surgery controlled, randomised trial". The Lancet. Neurology. 10 (4): 309–19. doi:10.1016/S1474-4422(11)70039-4. PMID 21419704. ^ Carter BJ (May 2005). "Adeno-associated virus vectors in clinical trials". Human Gene Therapy. 16 (5): 541–50. doi:10.1089/hum.2005.16.541. PMID 15916479. ^ Kaplitt MG, Feigin A, Tang C, Fitzsimons HL, Mattis P, Lawlor PA, Bland RJ, Young D, Strybing K, Eidelberg D, During MJ (June 2007). "Safety and tolerability of gene therapy with an adeno-associated virus (AAV) borne GAD gene for Parkinson's disease: an open label, phase I trial". Lancet. 369 (9579): 2097–105. doi:10.1016/S0140-6736(07)60982-9. PMID 17586305. ^ Carter BJ (2000). "Adeno-associated virus and adeno-associated virus vectors for gene delivery". In Lassic DD, Templeton NS (eds.). Gene Therapy: Therapeutic Mechanisms and Strategies. New York City: Marcel Dekker, Inc. pp. 41–59. ISBN 978-0-585-39515-9. ^ Bohenzky RA, LeFebvre RB, Berns KI (October 1988). "Sequence and symmetry requirements within the internal palindromic sequences of the adeno-associated virus terminal repeat". Virology. 166 (2): 316–27. doi:10.1016/0042-6822(88)90502-8. PMID 2845646. ^ Wang XS, Ponnazhagan S, Srivastava A (July 1995). "Rescue and replication signals of the adeno-associated virus 2 genome". Journal of Molecular Biology. 250 (5): 573–80. doi:10.1006/jmbi.1995.0398. PMID 7623375. ^ a b Weitzman MD, Kyöstiö SR, Kotin RM, Owens RA (June 1994). "Adeno-associated virus (AAV) Rep proteins mediate complex formation between AAV DNA and its integration site in human DNA". Proceedings of the National Academy of Sciences of the United States of America. 91 (13): 5808–12. Bibcode:1994PNAS...91.5808W. doi:10.1073/pnas.91.13.5808. PMC 44086. PMID 8016070. ^ Zhou X, Muzyczka N (April 1998). "In vitro packaging of adeno-associated virus DNA". Journal of Virology. 72 (4): 3241–7. PMC 109794. PMID 9525651. ^ Nony P, Tessier J, Chadeuf G, Ward P, Giraud A, Dugast M, Linden RM, Moullier P, Salvetti A (October 2001). "Novel cis-acting replication element in the adeno-associated virus type 2 genome is involved in amplification of integrated rep-cap sequences". Journal of Virology. 75 (20): 9991–4. doi:10.1128/JVI.75.20.9991-9994.2001. PMC 114572. PMID 11559833. ^ Nony P, Chadeuf G, Tessier J, Moullier P, Salvetti A (January 2003). "Evidence for packaging of rep-cap sequences into adeno-associated virus (AAV) type 2 capsids in the absence of inverted terminal repeats: a model for generation of rep-positive AAV particles". Journal of Virology. 77 (1): 776–81. doi:10.1128/JVI.77.1.776-781.2003. PMC 140600. PMID 12477885. ^ Philpott NJ, Giraud-Wali C, Dupuis C, Gomos J, Hamilton H, Berns KI, Falck-Pedersen E (June 2002). "Efficient integration of recombinant adeno-associated virus DNA vectors requires a p5-rep sequence in cis". Journal of Virology. 76 (11): 5411–21. doi:10.1128/JVI.76.11.5411-5421.2002. PMC 137060. PMID 11991970. ^ Tullis GE, Shenk T (December 2000). "Efficient replication of adeno-associated virus type 2 vectors: a cis-acting element outside of the terminal repeats and a minimal size". Journal of Virology. 74 (24): 11511–21. doi:10.1128/JVI.74.24.11511-11521.2000. PMC 112431. PMID 11090148. ^ a b Kyöstiö SR, Owens RA, Weitzman MD, Antoni BA, Chejanovsky N, Carter BJ (May 1994). "Analysis of adeno-associated virus (AAV) wild-type and mutant Rep proteins for their abilities to negatively regulate AAV p5 and p19 mRNA levels". Journal of Virology. 68 (5): 2947–57. PMC 236783. PMID 8151765. ^ Im DS, Muzyczka N (May 1990). "The AAV origin binding protein Rep68 is an ATP-dependent site-specific endonuclease with DNA helicase activity". Cell. 61 (3): 447–57. doi:10.1016/0092-8674(90)90526-K. PMID 2159383. ^ Im DS, Muzyczka N (February 1992). "Partial purification of adeno-associated virus Rep78, Rep52, and Rep40 and their biochemical characterization". Journal of Virology. 66 (2): 1119–28. PMC 240816. PMID 1309894. ^ Samulski RJ (2003). AAV vectors, the future workhorse of human gene therapy. Ernst Schering Research Foundation Workshop. pp. 25–40. doi:10.1007/978-3-662-05352-2_3. ISBN 978-3-662-05354-6. PMID 12894449. ^ Trempe JP, Carter BJ (January 1988). "Regulation of adeno-associated virus gene expression in 293 cells: control of mRNA abundance and translation". Journal of Virology. 62 (1): 68–74. PMC 250502. PMID 2824856. ^ Jay FT, Laughlin CA, Carter BJ (May 1981). "Eukaryotic translational control: adeno-associated virus protein synthesis is affected by a mutation in the adenovirus DNA-binding protein". Proceedings of the National Academy of Sciences of the United States of America. 78 (5): 2927–31. Bibcode:1981PNAS...78.2927J. doi:10.1073/pnas.78.5.2927. PMC 319472. PMID 6265925. ^ Sonntag F, Schmidt K, Kleinschmidt JA (June 2010). "A viral assembly factor promotes AAV2 capsid formation in the nucleolus". Proceedings of the National Academy of Sciences of the United States of America. 107 (22): 10220–5. Bibcode:2010PNAS..10710220S. doi:10.1073/pnas.1001673107. PMC 2890453. PMID 20479244. ^ Xie Q, Bu W, Bhatia S, Hare J, Somasundaram T, Azzi A, Chapman MS (August 2002). 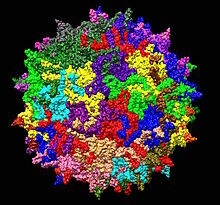 "The atomic structure of adeno-associated virus (AAV-2), a vector for human gene therapy". Proceedings of the National Academy of Sciences of the United States of America. 99 (16): 10405–10. Bibcode:2002PNAS...9910405X. doi:10.1073/pnas.162250899. PMC 124927. PMID 12136130. ^ Sonntag F, Köther K, Schmidt K, Weghofer M, Raupp C, Nieto K, Kuck A, Gerlach B, Böttcher B, Müller OJ, Lux K, Hörer M, Kleinschmidt JA (December 2011). "The assembly-activating protein promotes capsid assembly of different adeno-associated virus serotypes". Journal of Virology. 85 (23): 12686–97. doi:10.1128/JVI.05359-11. PMC 3209379. PMID 21917944. ^ Becerra SP, Rose JA, Hardy M, Baroudy BM, Anderson CW (December 1985). "Direct mapping of adeno-associated virus capsid proteins B and C: a possible ACG initiation codon". Proceedings of the National Academy of Sciences of the United States of America. 82 (23): 7919–23. Bibcode:1985PNAS...82.7919B. doi:10.1073/pnas.82.23.7919. PMC 390881. PMID 2999784. ^ Cassinotti P, Weitz M, Tratschin JD (November 1988). "Organization of the adeno-associated virus (AAV) capsid gene: mapping of a minor spliced mRNA coding for virus capsid protein 1". Virology. 167 (1): 176–84. doi:10.1016/0042-6822(88)90067-0. PMID 2847413. ^ a b Muralidhar S, Becerra SP, Rose JA (January 1994). "Site-directed mutagenesis of adeno-associated virus type 2 structural protein initiation codons: effects on regulation of synthesis and biological activity". Journal of Virology. 68 (1): 170–6. PMC 236275. PMID 8254726. ^ Trempe JP, Carter BJ (September 1988). "Alternate mRNA splicing is required for synthesis of adeno-associated virus VP1 capsid protein". Journal of Virology. 62 (9): 3356–63. PMC 253458. PMID 2841488. ^ Rabinowitz JE, Samulski RJ (December 2000). "Building a better vector: the manipulation of AAV virions". Virology. 278 (2): 301–8. doi:10.1006/viro.2000.0707. PMID 11118354. ^ Girod A, Wobus CE, Zádori Z, Ried M, Leike K, Tijssen P, Kleinschmidt JA, Hallek M (May 2002). "The VP1 capsid protein of adeno-associated virus type 2 is carrying a phospholipase A2 domain required for virus infectivity". The Journal of General Virology. 83 (Pt 5): 973–8. doi:10.1099/0022-1317-83-5-973. PMID 11961250. ^ Warrington KH, Gorbatyuk OS, Harrison JK, Opie SR, Zolotukhin S, Muzyczka N (June 2004). "Adeno-associated virus type 2 VP2 capsid protein is nonessential and can tolerate large peptide insertions at its N terminus". Journal of Virology. 78 (12): 6595–609. doi:10.1128/JVI.78.12.6595-6609.2004. PMC 416546. PMID 15163751. ^ a b Weitzman MD, Linden RM (2011). "Adeno-Associated Virus Biology". In Snyder, R. O., Moullier, P (eds.). Adeno-associated virus methods and protocols. Totowa, NJ: Humana Press. ISBN 978-1-61779-370-7. ^ Mori S, Wang L, Takeuchi T, Kanda T (December 2004). "Two novel adeno-associated viruses from cynomolgus monkey: pseudotyping characterization of capsid protein". Virology. 330 (2): 375–83. doi:10.1016/j.virol.2004.10.012. PMID 15567432. ^ a b Bartlett JS, Samulski RJ, McCown TJ (May 1998). "Selective and rapid uptake of adeno-associated virus type 2 in brain". Human Gene Therapy. 9 (8): 1181–6. doi:10.1089/hum.1998.9.8-1181. PMID 9625257. ^ Fischer AC, Beck SE, Smith CI, Laube BL, Askin FB, Guggino SE, Adams RJ, Flotte TR, Guggino WB (December 2003). "Successful transgene expression with serial doses of aerosolized rAAV2 vectors in rhesus macaques". Molecular Therapy. 8 (6): 918–26. doi:10.1016/j.ymthe.2003.08.015. PMID 14664794. ^ Nicklin SA, Buening H, Dishart KL, de Alwis M, Girod A, Hacker U, Thrasher AJ, Ali RR, Hallek M, Baker AH (September 2001). "Efficient and selective AAV2-mediated gene transfer directed to human vascular endothelial cells". Molecular Therapy. 4 (3): 174–81. doi:10.1006/mthe.2001.0424. PMID 11545607. ^ Rabinowitz JE, Xiao W, Samulski RJ (December 1999). "Insertional mutagenesis of AAV2 capsid and the production of recombinant virus". Virology. 265 (2): 274–85. doi:10.1006/viro.1999.0045. PMID 10600599. ^ Shi W, Bartlett JS (April 2003). "RGD inclusion in VP3 provides adeno-associated virus type 2 (AAV2)-based vectors with a heparan sulfate-independent cell entry mechanism". Molecular Therapy. 7 (4): 515–25. doi:10.1016/S1525-0016(03)00042-X. PMID 12727115. ^ Wu P, Xiao W, Conlon T, Hughes J, Agbandje-McKenna M, Ferkol T, Flotte T, Muzyczka N (September 2000). "Mutational analysis of the adeno-associated virus type 2 (AAV2) capsid gene and construction of AAV2 vectors with altered tropism". Journal of Virology. 74 (18): 8635–47. doi:10.1128/JVI.74.18.8635-8647.2000. PMC 102071. PMID 10954565. ^ Manno CS, Chew AJ, Hutchison S, Larson PJ, Herzog RW, Arruda VR, et al. (April 2003). "AAV-mediated factor IX gene transfer to skeletal muscle in patients with severe hemophilia B". Blood. 101 (8): 2963–72. doi:10.1182/blood-2002-10-3296. PMID 12515715. ^ Richter M, Iwata A, Nyhuis J, Nitta Y, Miller AD, Halbert CL, Allen MD (April 2000). "Adeno-associated virus vector transduction of vascular smooth muscle cells in vivo". Physiological Genomics. 2 (3): 117–27. doi:10.1152/physiolgenomics.2000.2.3.117. PMID 11015590. ^ Koeberl DD, Alexander IE, Halbert CL, Russell DW, Miller AD (February 1997). "Persistent expression of human clotting factor IX from mouse liver after intravenous injection of adeno-associated virus vectors". Proceedings of the National Academy of Sciences of the United States of America. 94 (4): 1426–31. Bibcode:1997PNAS...94.1426K. doi:10.1073/pnas.94.4.1426. PMC 19807. PMID 9037069. ^ Qing K, Mah C, Hansen J, Zhou S, Dwarki V, Srivastava A (January 1999). "Human fibroblast growth factor receptor 1 is a co-receptor for infection by adeno-associated virus 2". Nature Medicine. 5 (1): 71–7. doi:10.1038/4758. PMID 9883842. ^ Summerford C, Samulski RJ (February 1998). "Membrane-associated heparan sulfate proteo-glycan is a receptor for adeno-associated virus type 2 virions". Journal of Virology. 72 (2): 1438–45. PMC 124624. PMID 9445046. ^ Summerford C, Bartlett JS, Samulski RJ (January 1999). "AlphaVbeta5 integrin: a co-receptor for adeno-associated virus type 2 infection". Nature Medicine. 5 (1): 78–82. doi:10.1038/4768. PMID 9883843. ^ Qiu J, Handa A, Kirby M, Brown KE (March 2000). "The interaction of heparin sulfate and adeno-associated virus 2". Virology. 269 (1): 137–47. doi:10.1006/viro.2000.0205. PMID 10725206. ^ Pajusola K, Gruchala M, Joch H, Lüscher TF, Ylä-Herttuala S, Büeler H (November 2002). "Cell-type-specific characteristics modulate the transduction efficiency of adeno-associated virus type 2 and restrain infection of endothelial cells". Journal of Virology. 76 (22): 11530–40. doi:10.1128/JVI.76.22.11530-11540.2002. PMC 136795. PMID 12388714. ^ "Common virus 'kills cancer'". CNN. 22 June 2005. Retrieved 5 August 2009. ^ Penn State (23 June 2005). "Harmless Virus Kills Some Cancers". Science Daily. ^ Limberis MP, Vandenberghe LH, Zhang L, Pickles RJ, Wilson JM (February 2009). "Transduction efficiencies of novel AAV vectors in mouse airway epithelium in vivo and human ciliated airway epithelium in vitro". Molecular Therapy. 17 (2): 294–301. doi:10.1038/mt.2008.261. PMC 2835069. PMID 19066597. ^ Strobel B, Duechs MJ, Schmid R, Stierstorfer BE, Bucher H, Quast K, Stiller D, Hildebrandt T, Mennerich D, Gantner F, Erb KJ, Kreuz S (September 2015). "Modeling Pulmonary Disease Pathways Using Recombinant Adeno-Associated Virus 6.2". American Journal of Respiratory Cell and Molecular Biology. 53 (3): 291–302. doi:10.1165/rcmb.2014-0338MA. PMID 25845025. ^ Gao GP, Alvira MR, Wang L, Calcedo R, Johnston J, Wilson JM (September 2002). "Novel adeno-associated viruses from rhesus monkeys as vectors for human gene therapy". Proceedings of the National Academy of Sciences of the United States of America. 99 (18): 11854–9. Bibcode:2002PNAS...9911854G. doi:10.1073/pnas.182412299. PMC 129358. PMID 12192090. ^ a b Halbert CL, Allen JM, Miller AD (July 2001). "Adeno-associated virus type 6 (AAV6) vectors mediate efficient transduction of airway epithelial cells in mouse lungs compared to that of AAV2 vectors". Journal of Virology. 75 (14): 6615–24. doi:10.1128/JVI.75.14.6615-6624.2001. PMC 114385. PMID 11413329. ^ a b Rabinowitz JE, Bowles DE, Faust SM, Ledford JG, Cunningham SE, Samulski RJ (May 2004). "Cross-dressing the virion: the transcapsidation of adeno-associated virus serotypes functionally defines subgroups". Journal of Virology. 78 (9): 4421–32. doi:10.1128/JVI.78.9.4421-4432.2004. PMC 387689. PMID 15078923. ^ Chen S, Kapturczak M, Loiler SA, Zolotukhin S, Glushakova OY, Madsen KM, Samulski RJ, Hauswirth WW, Campbell-Thompson M, Berns KI, Flotte TR, Atkinson MA, Tisher CC, Agarwal A (February 2005). "Efficient transduction of vascular endothelial cells with recombinant adeno-associated virus serotype 1 and 5 vectors". Human Gene Therapy. 16 (2): 235–47. doi:10.1089/hum.2005.16.235. PMC 1364465. PMID 15761263. ^ Ortinski PI, Dong J, Mungenast A, Yue C, Takano H, Watson DJ, Haydon PG, Coulter DA (May 2010). "Selective induction of astrocytic gliosis generates deficits in neuronal inhibition". Nature Neuroscience. 13 (5): 584–91. doi:10.1038/nn.2535. PMC 3225960. PMID 20418874. ^ Kaludov N, Brown KE, Walters RW, Zabner J, Chiorini JA (August 2001). "Adeno-associated virus serotype 4 (AAV4) and AAV5 both require sialic acid binding for hemagglutination and efficient transduction but differ in sialic acid linkage specificity". Journal of Virology. 75 (15): 6884–93. doi:10.1128/JVI.75.15.6884-6893.2001. PMC 114416. PMID 11435568. ^ Di Pasquale G, Davidson BL, Stein CS, Martins I, Scudiero D, Monks A, Chiorini JA (October 2003). "Identification of PDGFR as a receptor for AAV-5 transduction". Nature Medicine. 9 (10): 1306–12. doi:10.1038/nm929. PMID 14502277. ^ "Adeno-associated Virus (AAV) Guide". ^ Zinn E, Pacouret S, Khaychuk V, Turunen HT, Carvalho LS, Andres-Mateos E, Shah S, Shelke R, Maurer AC, Plovie E, Xiao R, Vandenberghe LH (August 2015). "In Silico Reconstruction of the Viral Evolutionary Lineage Yields a Potent Gene Therapy Vector". Cell Reports. 12 (6): 1056–68. doi:10.1016/j.celrep.2015.07.019. PMC 4536165. PMID 26235624. ^ Flotte TR, Berns KI (April 2005). "Adeno-associated virus: a ubiquitous commensal of mammals". Human Gene Therapy. 16 (4): 401–7. doi:10.1089/hum.2005.16.401. PMID 15871671. ^ Garolla A, Pizzol D, Bertoldo A, Menegazzo M, Barzon L, Foresta C (November 2013). "Sperm viral infection and male infertility: focus on HBV, HCV, HIV, HPV, HSV, HCMV, and AAV". Journal of Reproductive Immunology. 100 (1): 20–9. doi:10.1016/j.jri.2013.03.004. PMID 23668923. ^ Zaiss AK, Liu Q, Bowen GP, Wong NC, Bartlett JS, Muruve DA (May 2002). "Differential activation of innate immune responses by adenovirus and adeno-associated virus vectors". Journal of Virology. 76 (9): 4580–90. doi:10.1128/JVI.76.9.4580-4590.2002. PMC 155101. PMID 11932423. ^ a b Zaiss AK, Muruve DA (June 2005). "Immune responses to adeno-associated virus vectors". Current Gene Therapy. 5 (3): 323–31. doi:10.2174/1566523054065039. PMID 15975009. ^ a b c Madsen D, Cantwell ER, O'Brien T, Johnson PA, Mahon BP (November 2009). "Adeno-associated virus serotype 2 induces cell-mediated immune responses directed against multiple epitopes of the capsid protein VP1". The Journal of General Virology. 90 (Pt 11): 2622–33. doi:10.1099/vir.0.014175-0. PMC 2885037. PMID 19641045. ^ a b Manno CS, Pierce GF, Arruda VR, Glader B, Ragni M, Rasko JJ, et al. (March 2006). "Successful transduction of liver in hemophilia by AAV-Factor IX and limitations imposed by the host immune response". Nature Medicine. 12 (3): 342–7. doi:10.1038/nm1358. PMID 16474400. ^ Sabatino DE, Mingozzi F, Hui DJ, Chen H, Colosi P, Ertl HC, High KA (December 2005). "Identification of mouse AAV capsid-specific CD8+ T cell epitopes". Molecular Therapy. 12 (6): 1023–33. doi:10.1016/j.ymthe.2005.09.009. PMID 16263332. ^ Rohr UP, Kronenwett R, Grimm D, Kleinschmidt J, Haas R (September 2002). "Primary human cells differ in their susceptibility to rAAV-2-mediated gene transfer and duration of reporter gene expression". Journal of Virological Methods. 105 (2): 265–75. doi:10.1016/S0166-0934(02)00117-9. PMID 12270659. ^ a b Matsushita T, Elliger S, Elliger C, Podsakoff G, Villarreal L, Kurtzman GJ, Iwaki Y, Colosi P (July 1998). "Adeno-associated virus vectors can be efficiently produced without helper virus". Gene Therapy. 5 (7): 938–45. doi:10.1038/sj.gt.3300680. PMID 9813665. ^ Myers MW, Laughlin CA, Jay FT, Carter BJ (July 1980). "Adenovirus helper function for growth of adeno-associated virus: effect of temperature-sensitive mutations in adenovirus early gene region 2". Journal of Virology. 35 (1): 65–75. PMC 288783. PMID 6251278. ^ Handa H, Carter BJ (July 1979). "Adeno-associated virus DNA replication complexes in herpes simplex virus or adenovirus-infected cells". The Journal of Biological Chemistry. 254 (14): 6603–10. PMID 221504. ^ Yalkinoglu AO, Heilbronn R, Bürkle A, Schlehofer JR, zur Hausen H (June 1988). "DNA amplification of adeno-associated virus as a response to cellular genotoxic stress". Cancer Research. 48 (11): 3123–9. PMID 2835153. ^ Yakobson B, Koch T, Winocour E (April 1987). "Replication of adeno-associated virus in synchronized cells without the addition of a helper virus". Journal of Virology. 61 (4): 972–81. PMC 254052. PMID 3029431. ^ Yakobson B, Hrynko TA, Peak MJ, Winocour E (March 1989). "Replication of adeno-associated virus in cells irradiated with UV light at 254 nm". Journal of Virology. 63 (3): 1023–30. PMC 247794. PMID 2536816. ^ "Introduction to Adeno-Associated Virus (AAV)". ^ "Adeno-Associated Virus and Adeno-associated Viral Vectors". ^ Duan D, Sharma P, Yang J, Yue Y, Dudus L, Zhang Y, Fisher KJ, Engelhardt JF (November 1998). "Circular intermediates of recombinant adeno-associated virus have defined structural characteristics responsible for long-term episomal persistence in muscle tissue". Journal of Virology. 72 (11): 8568–77. PMC 110267. PMID 9765395. Kimball JW (17 May 2015). "Gene Therapy II". Kimball's Biology Pages. Archived from the original on 18 March 2005. Retrieved 13 May 2005. "Adeno-associated virus". NCBI Taxonomy Browser. 272636.